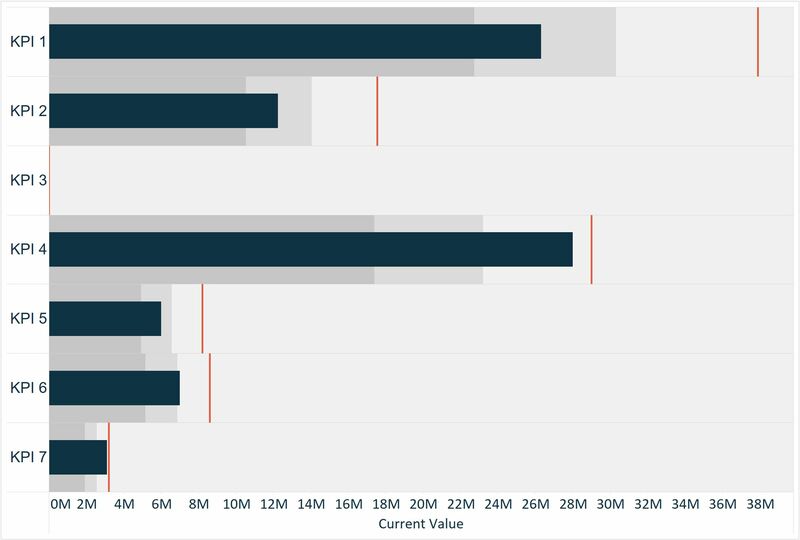 Pace charts are an alternative bullet graph design that normalize progress to goal visualizations across KPIs, even if the KPIs have different data formats, scales, and/or seasonal trends. They are useful for providing an apples-to-apples, pace-to-goal comparison in businesses that have KPIs that span different categories such as revenue, social media followers, attendance, etc. With KPIs such as revenue, social media followers, and attendance, not only are the metrics in different formats, but they are often on very different scales and have varying seasonality. For example, you may gain social media followers throughout an entire year, but if you are an NFL team, your attendance won’t start until August. Further, your growth on social media might be on a scale of thousands, while revenue may be on a scale of millions. 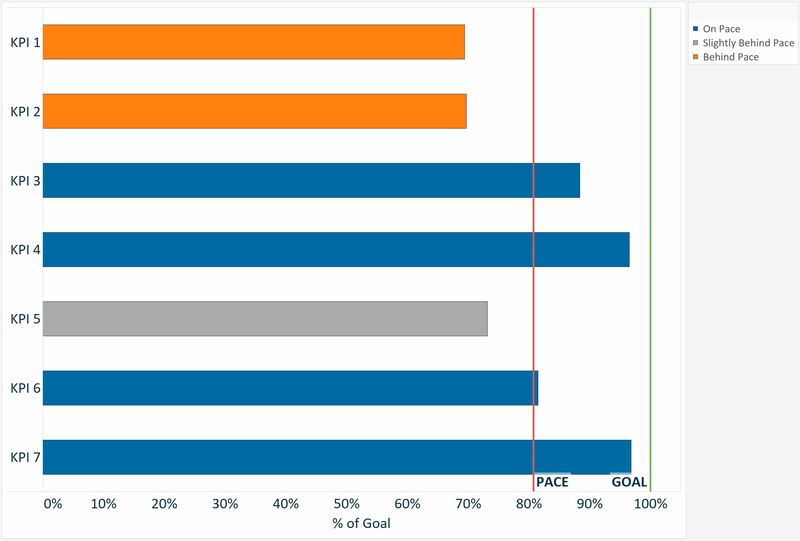 Pace charts normalize KPIs by comparing them all on an axis that ends at 100% (the goal). 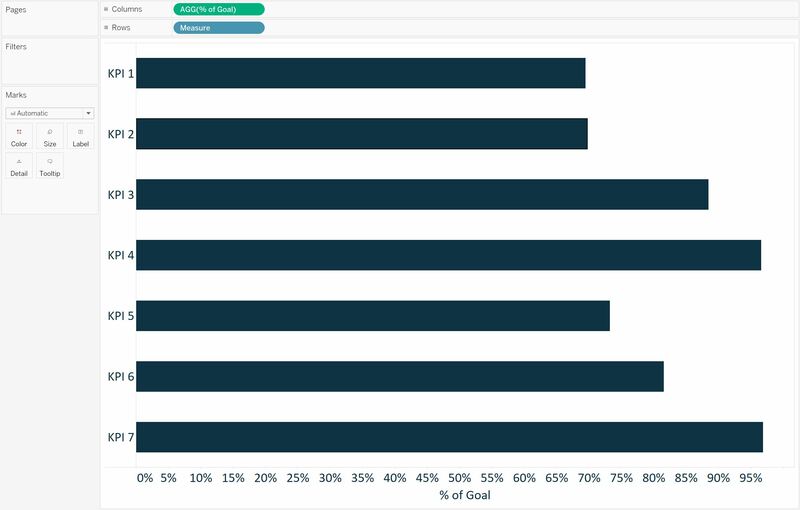 In addition to showing how much progress each KPI has made toward the goal, a linear or seasonal pace is displayed to illustrate whether progress to goal is on pace to reach goal. 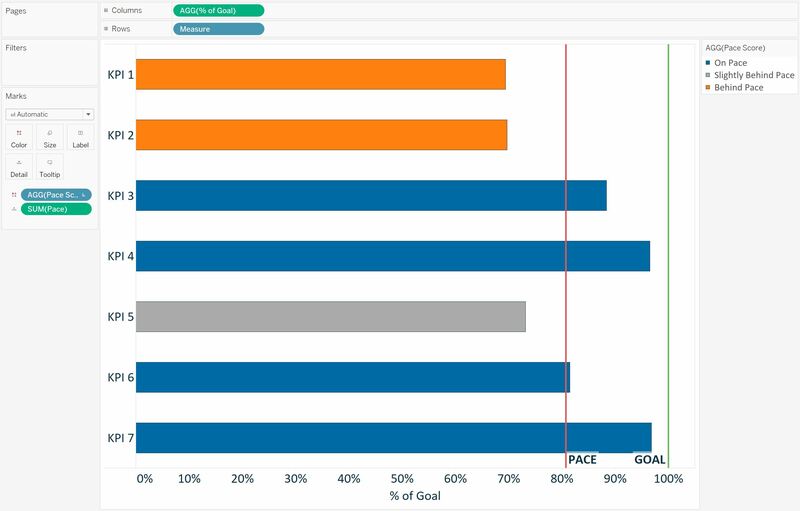 To enhance the illustration, the marks can be colored to show how current progress to goal for each respective KPI compares to its pace to goal. Even though the KPIs are on very different scales, it is easy to compare them to determine which are on pace, slightly behind pace, or behind pace. 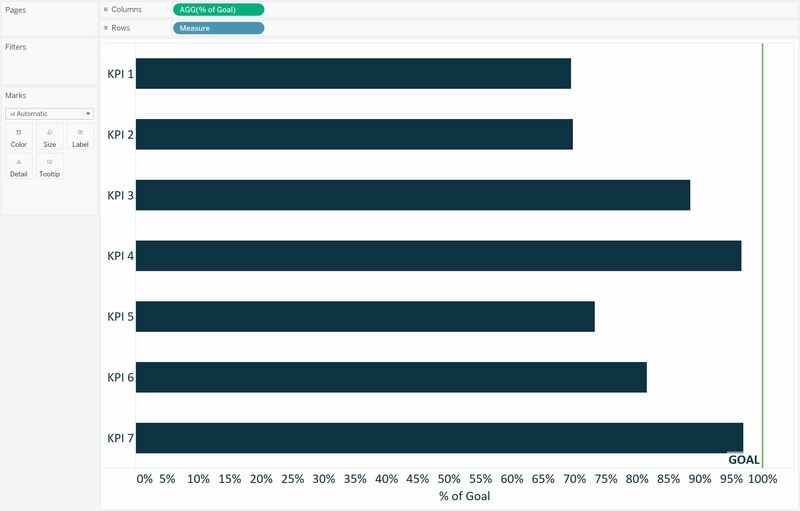 With this visualization, it is impossible to compare the progress to goal of KPI 3, which is on a much smaller scale than the other KPIs. 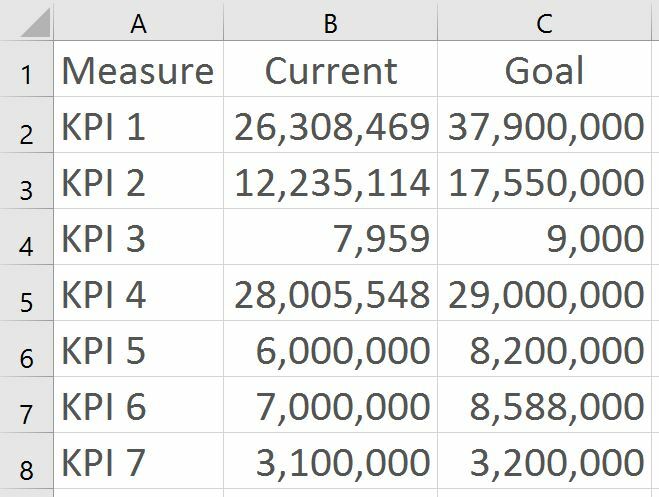 It is also challenging to determine the progress to goal of KPI 7, because it is on the same scale as KPI 1, which has the largest goal and is extending the x-axis. While you could break this graph up into seven different parts to fix the scaling, there is a better way to normalize the data. To normalize the bars in a pace chart, create a calculated field which calculates the progress to goal. This is used to represent the bars instead of the current values. 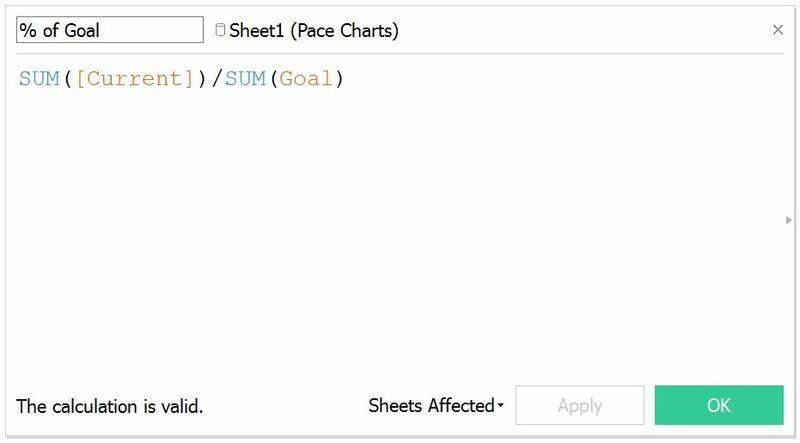 The formula for this calculation is [Current Value] / [Goal]. This calculation is dividing the year into 52 equal parts (i.e. weeks), then multiplying that fraction by the number of weeks that have passed in the year. 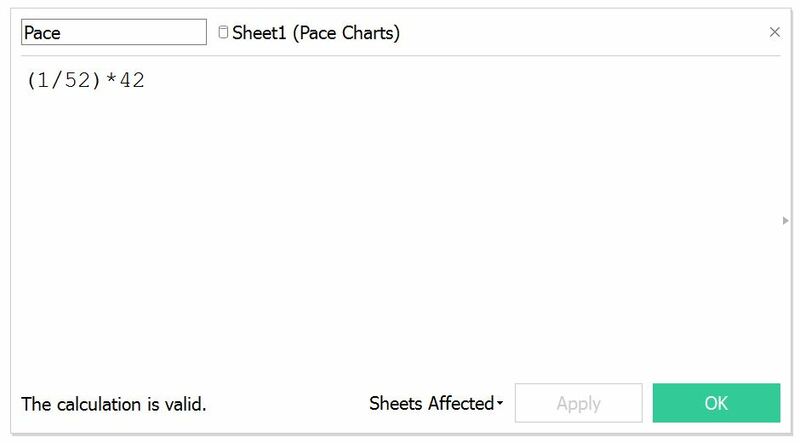 In Tableau, you have the option to replace the 42 with a parameter that allows the end user to change the multiplier. 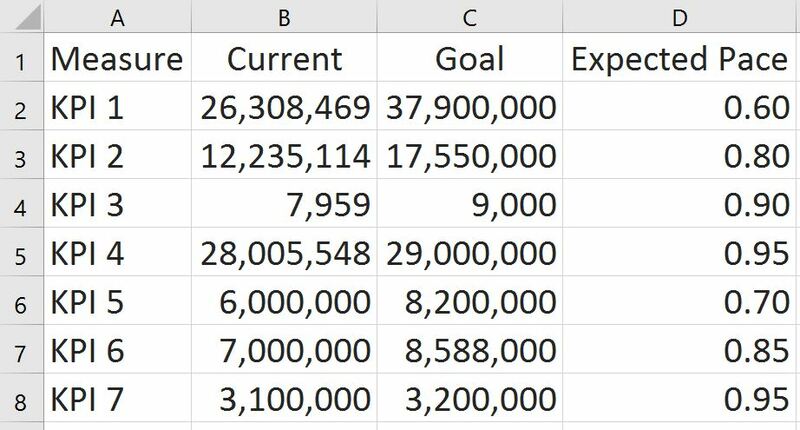 In this tutorial, we used a linear pace that was calculated by taking 1/52 of the year multiplied by the current week of the year. However, this pace can be replaced with a different metric such as the value for each KPI at this point last year, or a goal for each respective KPI at this point in the year. Notice how this seasonal pace chart tells a different story regarding the progress to goal for each KPI than the pace chart with the linear pace. 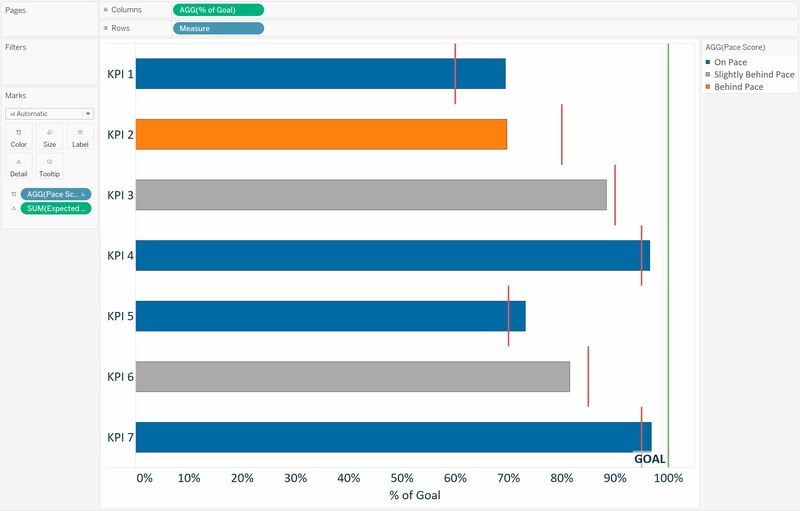 But in both cases, pace charts were used to normalize progress to goal calculations across KPIs to get a more effective visualization about the business. Very clear and well done. I will give it a try.